Sometimes I like to take a break from drawing and paint with acrylics. I don't feel particularly skilled as a painter in this realm, but I find the process immensely relaxing and freeing. This is part of a painting I just finished. I'm only showing part because, well, it's my favorite part. I guess I can do that kinda thing, can't I? I've noticed that my approach to painting with acrylics on canvas is very different from the work I do in my sketchbook. Of course the media itself makes a difference, but I also have different end goals in mind. For this sort of thing I like to take my time, days if I need to. I'll paint a layer and then a completely different layer and then another. Sometimes one painting actually has about 15 paintings underneath. While line quality is important to me when drawing, when painting the focus shifts to color, composition and texture. I tend to avoid intricate details, opting instead for bolder patterns and shapes. Rather than pushing through the limitations of the medium, I allow them to influence what I do and how I react. I love doing some artistic work diff. than my normal ... it free's my inner critique, and gives me an excitement I may have lost in my ususal stuff. Like how you keep us guessing. Gunna show us more???? This looks really interesting. 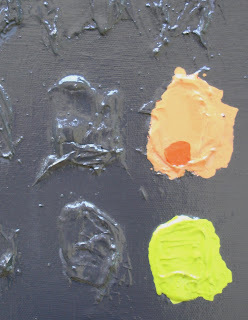 I like the texture you've got in the painting and contrast with the bright yellow and the gray.